La Rosa Flower shop started their flower shop business in the Philippines on 2000 with 2 shops in Quezon City. La Rosa was founded by Ms. Emma San Jose, Mr. Livy Darocca and Ms. Sally San Jose. Each founder has more than a decade of experience in the Flower arrangement industry which serves as one of the strength of La Rosa as a company. 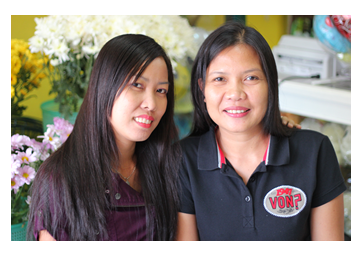 Their vision is to provide beautiful and affordable flower arrangements to the Philippine market. La Rosa has established an online presence with the use of their online flower shop. With the help of the internet they are able to cater people from all over the world who want to send flowers in the Philippines. La Rosa is continuously improving means and ways to make buying and sending flowers to the Philippines. With their years in the business, La Rosa has the capacity to provide their clients with a broader line up of flower arrangements and designs. La Rosa takes pride with their work and they are happy that the flowers they provide and serve will become part of your occasion.